Preheat oven to 350 degrees. Butter and flour a 4 1/2-by-8 1/2-inch loaf pan. Whisk together flour, baking powder, and salt. In a large bowl, using a mixer, beat butter and granulated sugar on medium-high until light and fluffy, 8 minutes, scraping down bowl as needed. Add vanilla, then eggs, one at a time, beating well and scraping down bowl. With mixer on low, add flour mixture in 3 additions, alternating with two 1/2-cup additions buttermilk, and beat until combined. With a rubber spatula, fold in 1 1/4 cups coconut. Whisk together confectioners' sugar and remaining 2 tablespoons buttermilk. Drizzle over cake and sprinkle with remaining 1/4 cup coconut. 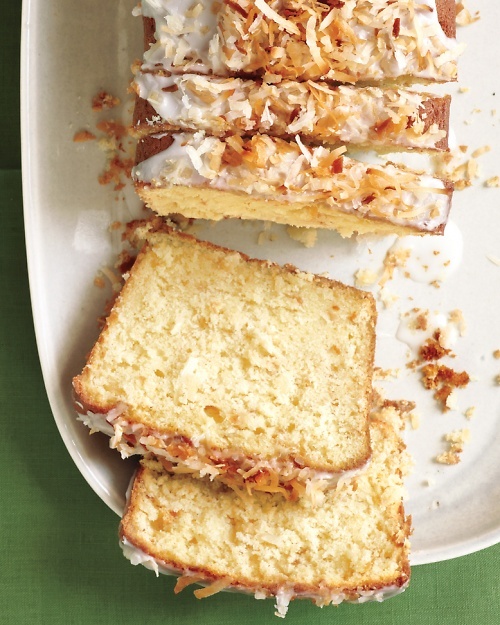 Tangy buttermilk balances this rich coconut cake. It's also used to make the thick glaze.